It’s now been over ten years since I started Geocaching, the worldwide game that started when the US government turned off selective availability on the worldwide GPS system giving the accuracy that we now rely on for satellite navigation systems in our cars, and that allowed Dave Ulmer to hide a plastic bucket, and Mike Teague to find it purely from the location details Dave posted on the sci.geo.satellite-nav newsgroup back in May 2000. We got started back on Spring Bank Holiday in May 2001, finding GC171 – View from Coombe Hill which amazingly is still there a decade later – you can see proof of that in this collage of pictures from the camera in the cache. Many of our early finds are now gone, although another cache that is over a decade old now is our own GCBE3 – The Queens Oak which has been hidden in four different spots over the years around St James’ in Finchampstead – it’s had to move a couple of times due to maintenance work on the church grounds exposing the hiding place, and once because of safety concerns over a wall. It’s also been totally replaced with a new container following an incidence of cache trashing. We’re certainly not high scoring cachers if you look at our stats – although it’s worth remembering that back when we were caching frequently the caches were a lot further apart – my nearest hundred caches covered about half the country, now I have one hundred caches within a few miles. Over the years we’ve tended to cache on holidays mostly, and to be honest after delving into cacher politics for a bit with approving caches, and being one of the founders of the Geocaching Association of Great Britain I’ve largely kept a low profile. What is interesting though is looking at how the game has changed over ten years. Back at the beginning you needed what could be regarded as a pretty specialist bit of kit to play the game, now with millions of people across the country having a GPS enabled smartphone almost anybody can join in easily. I’m also somewhat amused now at one of the biggest early rows, which related to a local cacher around here, a chap called Robin Lovelock. He owns a company producing GPS software and hid a lot of geocaches in the local area, but alongside the usual trinkets put a copy of his software and a business card in each cache. This caused uproar on the cache forums because it was commercialising the game, and because of the cache density – one person said to me that he didn’t want the game to be such that you were tripping over a cache on every corner. What is amusing now is firstly that Groundspeak are quite happily running a commercial business based around the game and were back then, but more importantly the cache density in our area is now way in advance of the number that Robin placed back then – indeed from St James’ there is a circuit of over twenty caches that can be completed in a couple of hours. Another change is the size of the caches. I started to notice things were changing a couple of years back when people finding our Queens Oak cache started commenting on how big the box was. From my point of view, when I hid it most caches were ammo cans, and the tupperware container we used was a pretty average size. Certainly it wasn’t the biggest – that honour goes to the UK Project A.P.E. Cache, GC12AD – Mission 10b: Meridian Snake. As a side story, this cache I actually ended up making two trips to in order to be first to find. The first trip was about an hour after the location had been published, at which point I discovered that Groundspeak had screwed up the coordinates, having returned home, moaned online and had the correct coordinates I then drove back down and was first to find the next morning. The picture here shows Beth with the cache container – I guess you can see why I was surprised at people describing our little tupperware tub as big. To be honest having a cache this big doesn’t exactly make the game difficult – you could see this one across the field from where it was, which is kind of why it didn’t last that long. Having the smaller caches does make the game more challenging, even if it does mean that the space for swaps is somewhat less. Going along with the size change there are now more micro-caches, even in rural areas, which didn’t seem to be done when we started. Our micro-cache was placed in an urban area, but recently I’ve found micro-caches hidden in false rocks, magnetically attached to the top of a direction sign, and even a magnetic key container attached to the underside of a rural post box. What hasn’t changed though is that it is still a relatively unknown activity – certainly with the recent geocache bomb scare it was pretty clear that nobody in the local police organisation knew anything about the game, and that is despite regular TV spots over the past ten years, including one featuring a somewhat younger Richard and Beth! There is still a regular influx of new people starting the game, promotion from GPS manufacturers, and word of mouth promotion. I suspect we’ll be doing more caches as the children get older. Lucy has already come on a couple of cache hunts with me, and seemed to enjoy the treasure hunt, and with 1.3 million caches worldwide we’re not going to run out of things to find any time soon. Following on from my hard drive troubles at the weekend I’ve uploaded a whole batch of scanned pictures I managed to salvage from the drive, all of which probably come under the category of archive material! 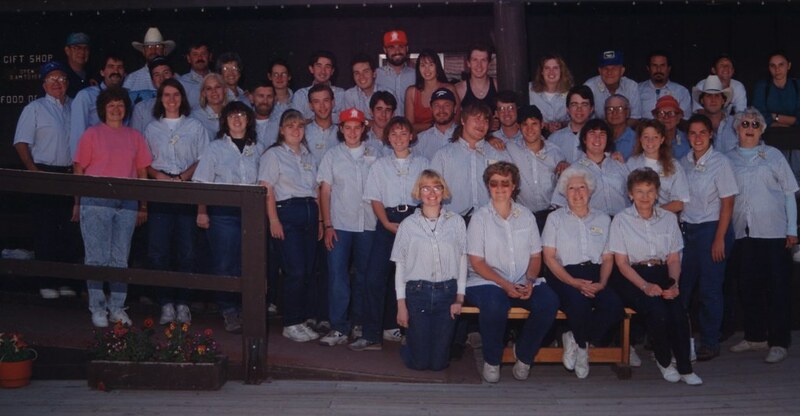 There are several group shots, including a picture of the class of ’91 from my school, most of my Computer Science course from 1994, the employee group shot from Flagg Ranch where I worked during summer 1993 and a shot of the development team at my first job. 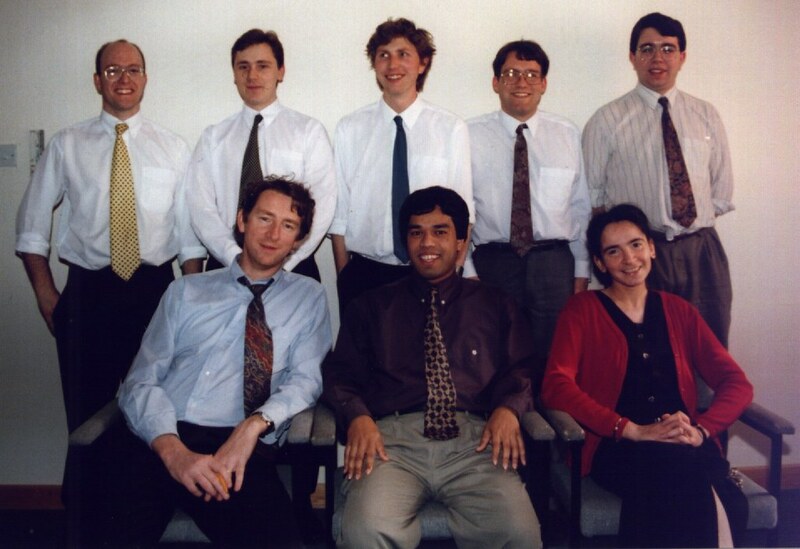 I’m a lot easier to spot in some of the pictures than others, but I am in all four. 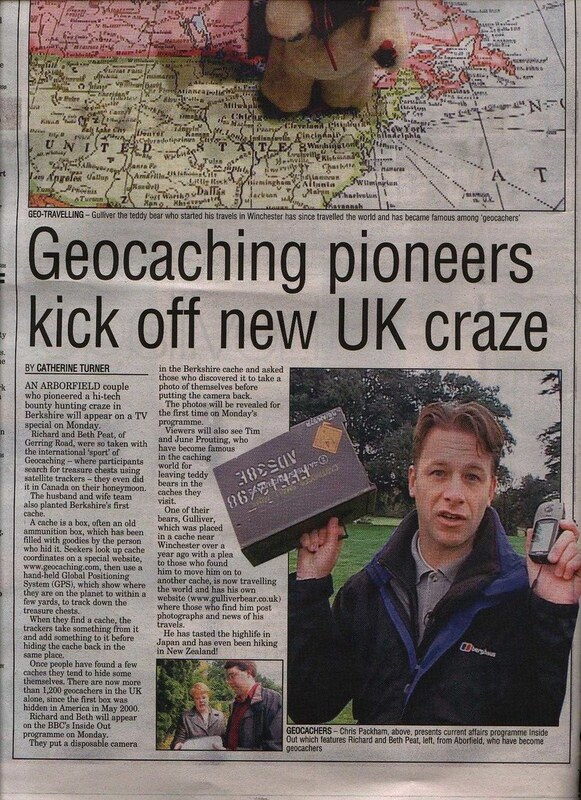 There are also a couple of scans of cuttings relating to the Geocaching video I posted a couple of months back. The biggest set is a whole load of pictures from our wedding back in 2001 – not the official shots but a mixed bag of pictures from the table cameras, and various other snapshots people took. You can also see the house Beth lived in when she first moved to the UK. Alongside all of those are a kind of ‘best of’ selection of some of the pictures I took on my trips to Morocco, and to Syria and Jordan. 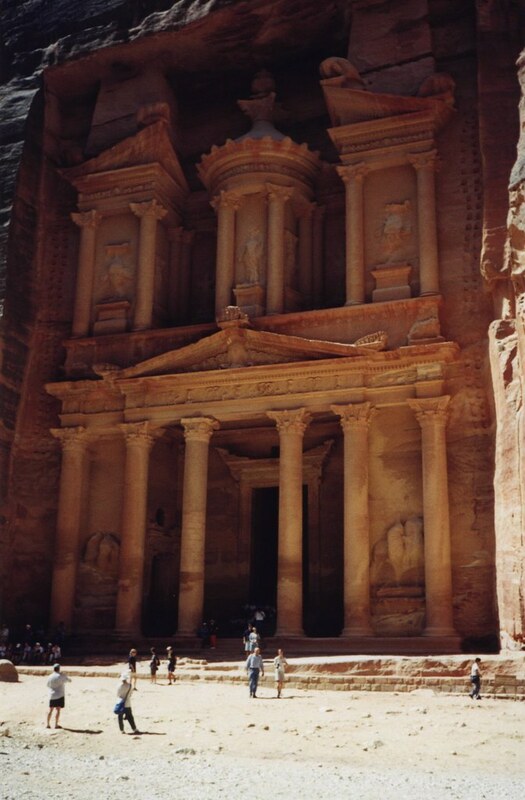 This one of Petra will probably be familiar to anybody who has come to our house as an enlargement of it hangs in our hallway. 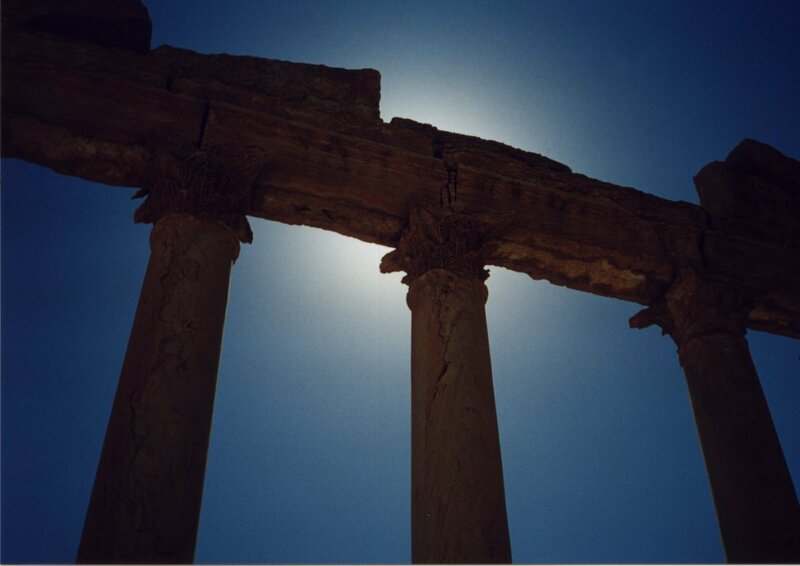 The picture above is one from my Morocco trip, and is my being experimental with shooting pictures of the Roman ruins. So since I have a nice little device that can play video, I’ve been trawling through all the old video clips I have sitting around to try them out. One item I came across was this, our fifteen minutes of fame from early 2003 back when Inside Out interviewed us about Geocaching (see their page about the show here) which went out originally in the Southern area, and in some other regions later on. The clip sequence is especially notable for the fact that thanks to the BBC cutting everything I said it’s basically Chris Packham interviewing Beth and me holding the box… It’s also worth it for Dan and Pid, the infamous night cachers who appear after us. Enjoy. Incidentally, the full set of pictures from the cache, up to the point the camera was removed can be seen online here. Where known the pictures include the names of the cachers.